Following on from last week's positive vibes, I'm getting excited for the biggest show of my life, the Festival of Quilts which is only a couple of weeks' away now, eek! I'm well into the kit building as you can see above, and the printing I out-sourced to a local firm came back yesterday. So the for the next few days you'll find me folding, packing and sticking these and many more kits and trying to fit them into the tower of banana boxes my father-in-law kindly found for me. And then it's on to the strip, charm pack and fat quarter bundles - phew! It's going to be a busy few weeks, and in the hottest summer we've had for years! Haha! If you're coming along to this year's Festival of Quilts in August, I will be on Stand F16 so pop by and say hello. As well as all these quilt, cushion and EPP kits, I've also had many more patterns printed up, some of which will come with the relevant pre-cut papers. These will also be available on the website after the show. 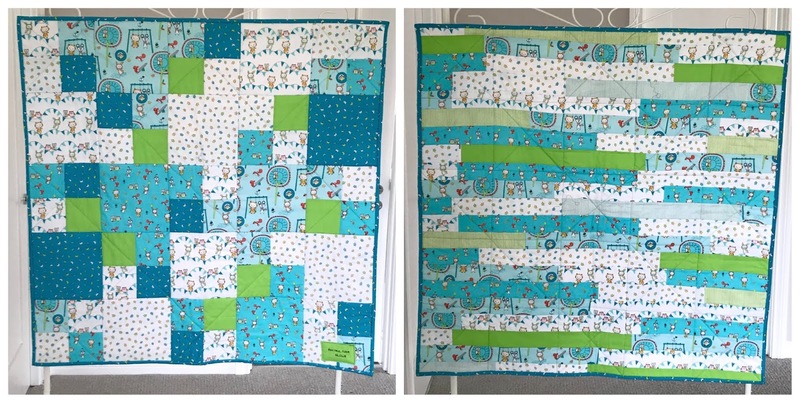 Meanwhile, I wanted to share this adorable quilt, again made by Gillian who has been busy! Gillian made this cute four-patch quilt from my Let's Play fat quarter bundle - I love the mix of four-patch blocks with the larger squares that really show off the fabrics, and that stripped backing takes pieced backings to another level - this really is two quilts in one! Thanks for sharing Gillian. Wow you are one busy gal. Good luck with it all. Thank you Kris, hopefully all this work will be worth it! I hope it goes well for you! Judging from all the boxes you have been busy and I love the look! Thanks Jayne, I'm so glad I got some proper printing done, the boxes look very professional now ;) Hopefully it'll work! Lots of work in store but how much fun will it be at Festival of Quilts where you can chat with the folks who are browsing (and hopefully buying!) Enjoy. Thank you Bonnie, I am looking forward to meeting like minded people, that's the fun bit! Cute quilts! Good luck with packing, and for the Festival! Thank you Frederique, I'm nearly there now!